To settle down, you just need to buy a farm in the Town you wish to stay in, if you have no existing farm at that point of purchase. Buying a farm in that Town of that particular State means you are part of that State. To change State, you just need to destroy your farm, move to a Town belonging to the new State, and settle down by purchasing a new farm. Click to enter your farm. You start with an empty lot, on which you will be required to build a home(ranch) on your plot of land. 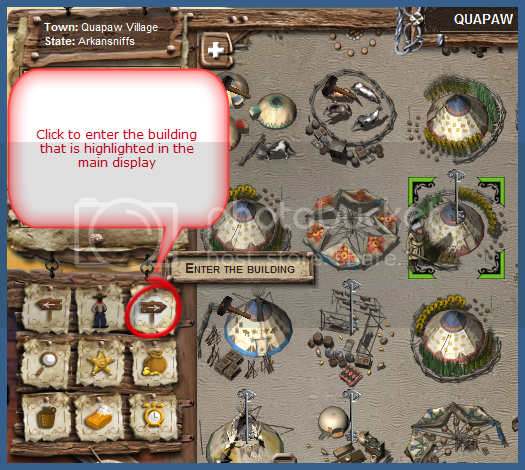 You will be asked to place your home (Example shown in picture above on how a cowboy and an indian home will look like, you will only have one of course. 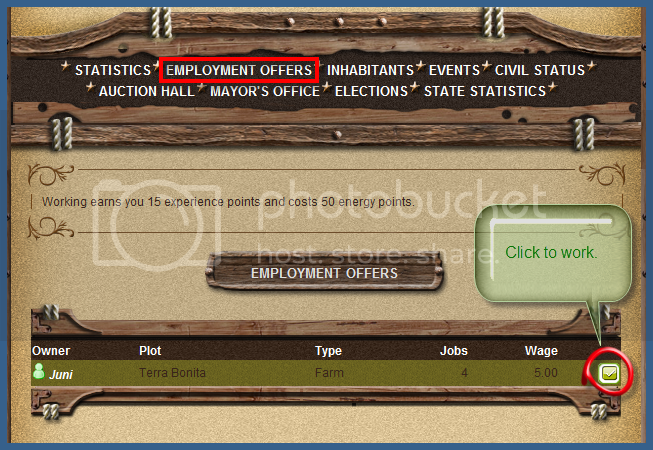 ), a range of options for your farm will appear when you click on it. 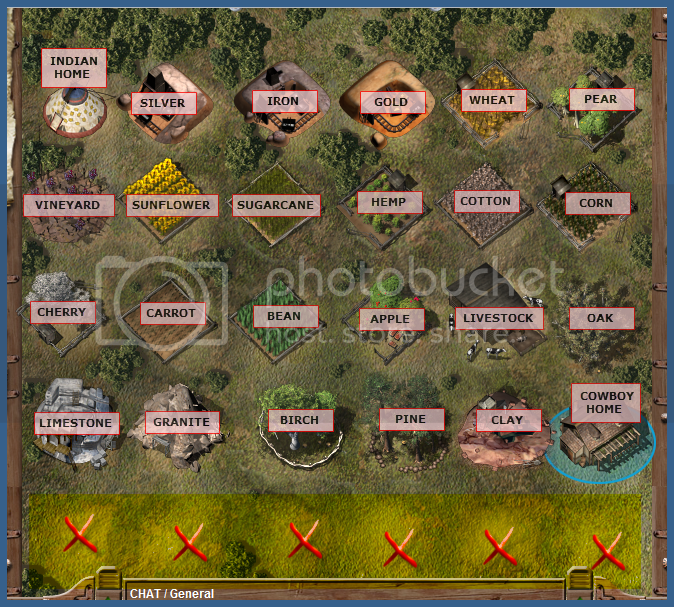 As shown in the picture are all the available types of [FARMING/BREEDING/EXTRACTION] that you can place on the empty plots of land. You may or may not be able to have everything on there depending on the types of upgrades your have chosen to apply to your land. NOTE: The area plots "X-ed"out are not usable. It's just part of the landscape. Storage : This where your may store some items. You may also be able to make a hideout to store items which will be safe from thieves. Security : Security items are kept here if bought and used/placed. You may click on the security upgrade to increase this capacity to store more to increase % of security. Comfort : Comfort items are stored here if bought and used/placed. You may click on the comfort upgrade to increase this capacity to store more to increase % of comfort. When you use the option to sleep at home, you will get an extra 20% energy/hour. Increasing comfort % by ~ 2.5% will increase bonus energy received sleeping at home by 1 point. Hygiene : Hygiene items are stored here if bought and used/placed. You may click on the hygiene upgrade to increase this capacity to store more to increase % of hygiene. You receive a basic of +20% hygiene per bath, which will increase when more hygiene items are used at home. Well : The well enables you to draw water to quench your thirst, water crops or water your livestock. It fills depending on the rainfall. Events : events of all things done / happened in your home. Note : Your home will suffer from daily wear - you have to repair or lose some upgrades. Having comfort/security/hygiene helps to reduce rate of wear. You will be able to choose your upgrades here to unlock certain options which will allow you to do perform various activity on your ranch. The upgrades are available according to the condition of your ranch. 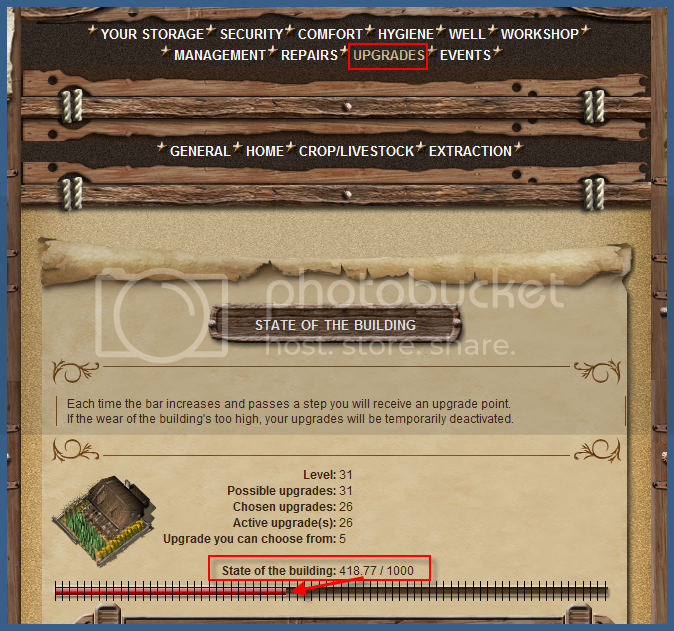 Under repairs/upgrades page, you can check your state of building. Each time the bar increases and passes a step you will receive an upgrade point. If the wear of the building's too high, your upgrades will be temporarily deactivated, thus you must repair it regularly. currently deactivated upgrade = upgrades which has been deactivated due to home not being repaired. A warning about the deactivation flashes in RED on the main display when you access the repair & upgrade page. 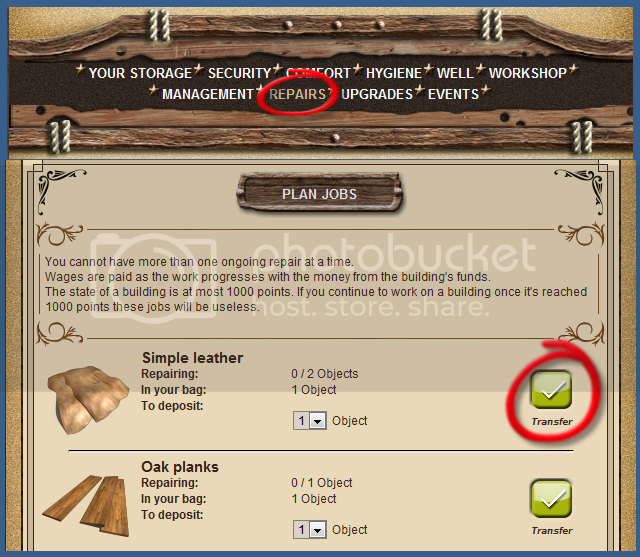 If repair is not being done, your last point of upgrade will be deactivated the next day. 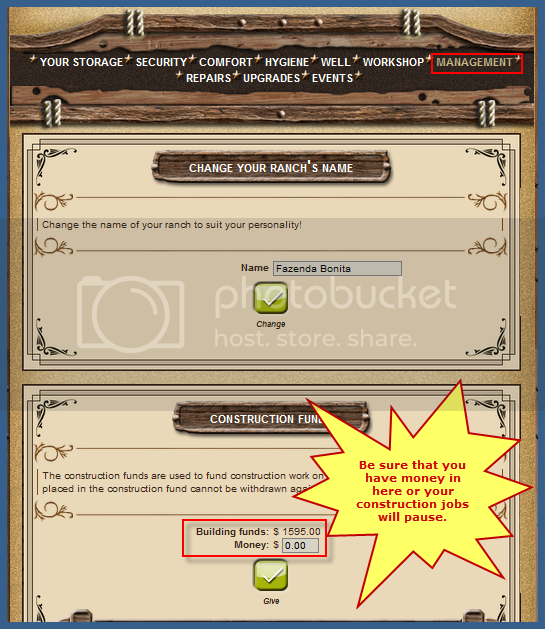 To repair your ranch to add additional upgrades, access the repair page, and it will indicate the materials required to repair your home for this stage. You can extract materials or buy them from shops / markets, and transfer them from your bag to home. 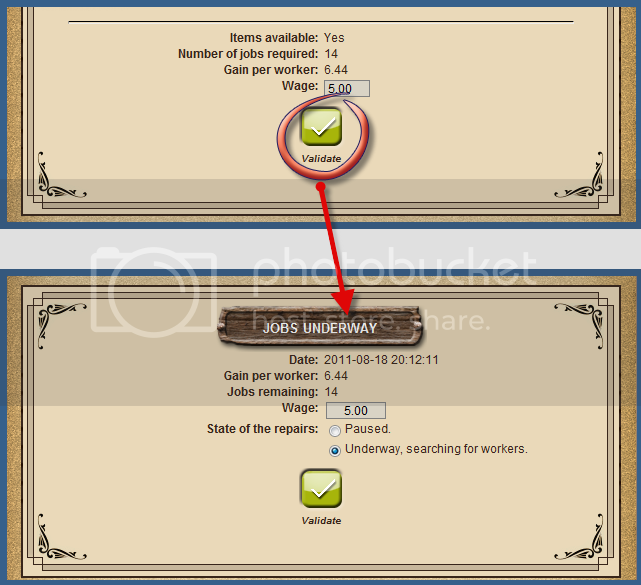 After transferring all the materials required to this stage of repair, you can launch the jobs to work on. Proceed to the Town Hall/ Grand Council and you will see the jobs generated by the repair done on your home listed under EMPLOYMENT OFFERS. Take note that you are required to have enough $money$ to pay the wages for the jobs launched above or the jobs will pause itself until money is added into the building funds and no one will be able to work on them, including yourself.